I like products from Pure Thoughts and I have dip in and out of their range over the years. It had been a while since my last purchase so I decided to place an order. If you have been following my YouTube channel you will have heard me mention the Raspberry & Almond Face Scrub. This scrub is a powder which you mix with water. It can be a bit messy but I do not mind. The beauty of a product in powder form is an extended shelf life and free from preservatives. I do not exfoliate regularly so usually a scrub will expire before I reach the end of the tube. Most of the time a muslin cloth is enough exfoliation for me but every once in a while I like to have a deeper polish. It is a gritty scrub so may not be suitable for everyone but I do find by varying the amount of water I can adjust the consistency to suit me. I will advise that you need to be careful with scrubs as too much, too often can be damaging to the skin. The bright pink/red colour from raspberries just makes me smile. Your face does look like a horror movie when applied as it momentarily stains in colour. Overall, I think this is a nice product which does the job it was intended for and it makes my skin feel softer and brighter. 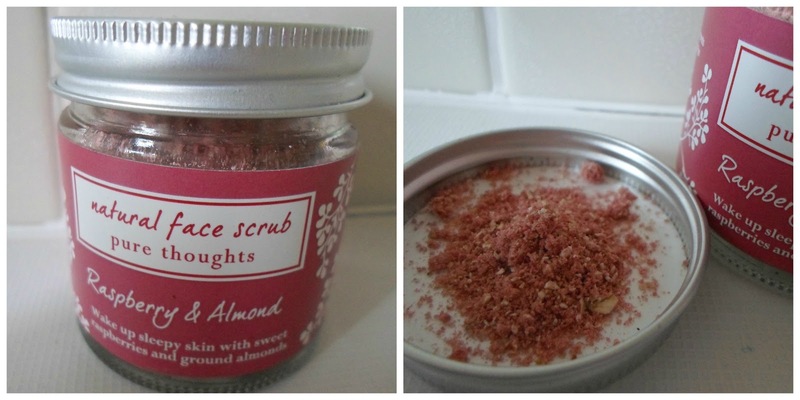 I think value for money is great, a 30g jar costs £7 which Pure Thoughts says should be enough for 10 treatments. I also stocked up on some face masks when I placed my order as I like the Banana & Yellow Clay. Have you tried any products from Pure Thoughts? Do you like products in powder form?